Qualcomm settles long-lasting patent disputes with Apple. 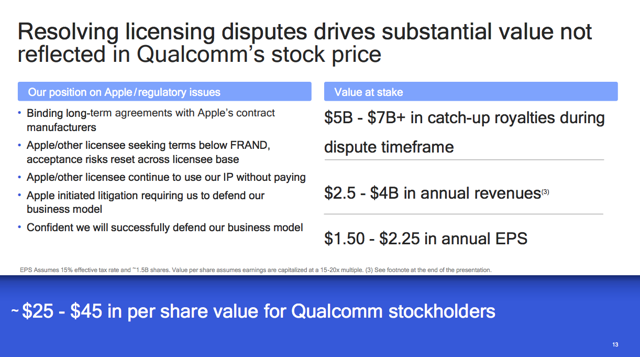 In no big surprise to investors following our investment research on Qualcomm (QCOM), the company was able to obtain a settlement with Apple (AAPL) over their wide disputes on patent royalties. The wireless technology giant had already garnered settlements in China and South Korea along with recent admission from Japanese regulators that Qualcomm was not a monopoly. Along with constant signs that Apple was struggling to obtain a viable 5G modem by 2020, the expected outcome was a settlement that would send the stock soaring. Outside of unexpected financial terms, Qualcomm heads higher. During the trading day on Tuesday, news broke that Qualcomm and Apple had agreed to settle their long-going royalty dispute. The companies were awaiting the outcome of an FTC suit and had just started a jury trial in San Diego so the dispute was reaching a boiling point. The timing of the settlement isn't a surprise as most data points favored Qualcomm winning these suits. 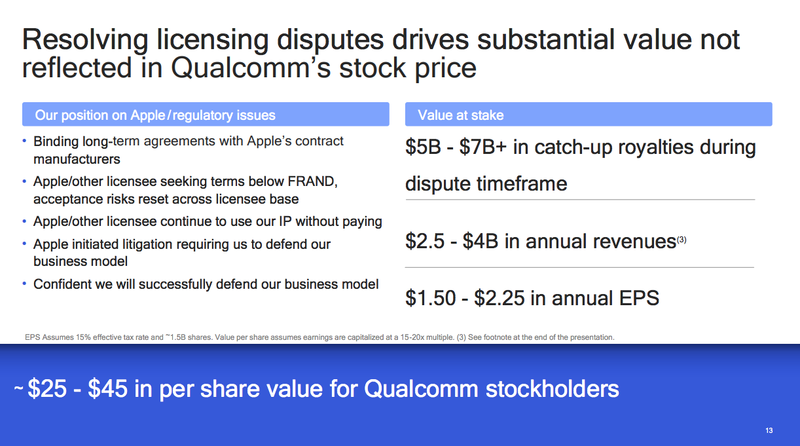 The financial details of the settlement are limited, but Qualcomm provided investors with this slide on the license agreement. Some of the key terms were the deal includes a six-year term with Apple paying royalties to Qualcomm effective April 1. The deal includes a one-time payment from Apple to Qualcomm. In addition, the companies signed a multi-year chipset supply agreement suggesting Apple wasn't happy with the chips from Intel (INTC) recently used to replace those from Qualcomm. 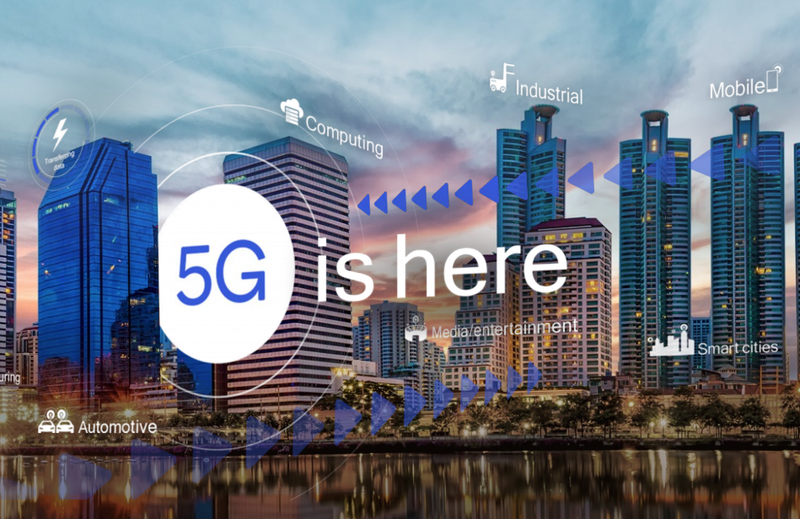 Maybe most importantly, the 5G chips were becoming a huge problem that had Apple possibly missing the 2020 target for a 5G iPhone and insulted that Huawei thought the leading smartphone company was in such distress that it would dare accept a Chinese chip in its 5G iPhones. Possibly the biggest key is the Qualcomm projection that the company will see an incremental EPS boost of ~$2 as product shipments ramp. Other people can talk about the legal implications of the settlement and the lawsuits but the key here to investors is the financial benefits to Qualcomm. Management had long claimed a $7+ EPS target once reaching a settlement with primarily Apple, but also with Huawei. The projection included a $1.50 to $2.25 EPS boost from settling these patent royalty disputes with both key smartphone manufacturers. Closing a deal with Apple likely improves the opportunity of getting Huawei into the fold beyond some of the partial payments in the last few quarters. Assuming the projected ~$2 EPS boosts doesn't include any of the one-time benefit from the past due amounts, Qualcomm should be on pace for at least a $6+ EPS. Analysts already had the company earning around $4.35 in FY20 without this settlement with Apple. Qualcomm closed the day at $70.50 so the stock would appear to have upside with Apple settled and the ability to now focus on dominating the global 5G rollout. The settlement is a clear signal that Qualcomm is a required technology to launch the next generation wireless services. One key data point is to watch for any official licensing rates. Qualcomm had recently reduced their royalties to a rate of 2.275% on single-mode 5G handset's wholesale prices, or 3.25% of a multi-mode handset price, capped at $400. The new rate per phone was capped at $13.00 while Apple was previously getting a rebate that reduced the rate to only $7.50 per phone. 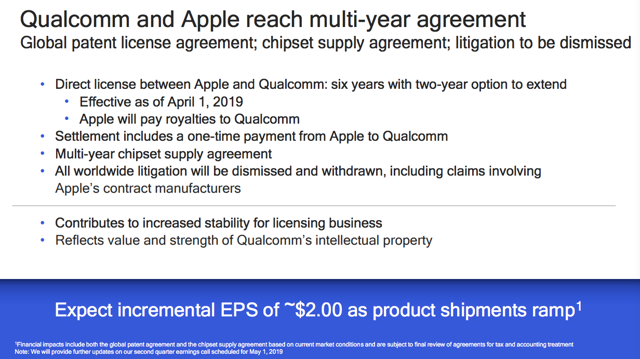 Any material differences in these rates probably isn't possible for Qualcomm to see a $2 EPS boost from the Apple deal. Regardless, investors should be on the lookout for revised terms. The key investor takeaway is that a big part of the upside from settling with Apple was already realized with the 23% rally on Tuesday. The stock is still cheap with the company still on pace to achieve the $7 EPS target and a potential to now see adjacent areas in wearables and connected cars to actually contribute to EPS growth going forward. Investors shouldn't rush to sell Qualcomm on this initial pop. Disclosure: I am/we are long QCOM, AAPL. I wrote this article myself, and it expresses my own opinions. I am not receiving compensation for it (other than from Seeking Alpha). I have no business relationship with any company whose stock is mentioned in this article.